1980) owner of more than 12 businesses. started Greater Good Radio to help businesses help the community while benefiting their bottom line. On their radio show - and now through their book, they interview top entrepreneurs on their business but also their community involvement. By making these interviews available through the media they hope to inspire future leaders. 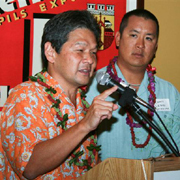 community-related businesses, his firm AIO owns, among others, Hawaii magazine, Honolulu and Hawaii Business, as well as Hawaii Winter Baseball, and ESPN 1420 radio. Duane is also a minority owner of Honolulu Star Bulletin, the San Francisco Giants, and Aloha Airlines. All Shidler College of Business alumni, faculty and students are invited to this presentation, book signing, networking opportunity, and alumni membership event. Books will be available for purchase and signing.